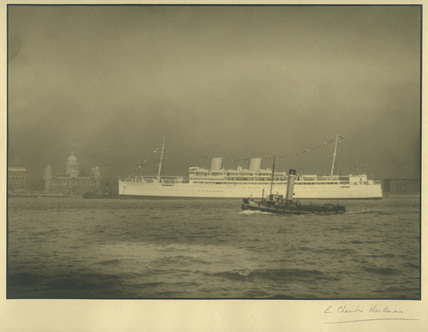 Photograph of the SS Reno del Pacifico on its maiden voyage from Liverpool. The ship is moving across the picture from right to left with a tug in front of it. In the background to the left you can clearly see the Liver Buildings on the Liverpool Waterfront. Published in the Liverpool Post and Mercury in August 1931.